most people who have attended a fair number of rock concert will tell you that what makes it all worthwhile are those rare nights when the combination of talented musician, the right atmosphere and a variety of intangibles produces a couple of hours of really good solid music; the kind that makes you want to jump out of your seat, or scream, or pound your chest. 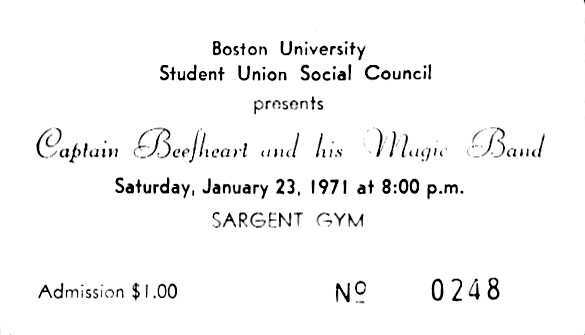 one of these magic evenings happened at boston university's sargent gym a week ago saturday, when the widely diverging talents of captain beefheart and ry cooder came together to produce an uninterrupted flow of beautiful sound in front of a packed house. 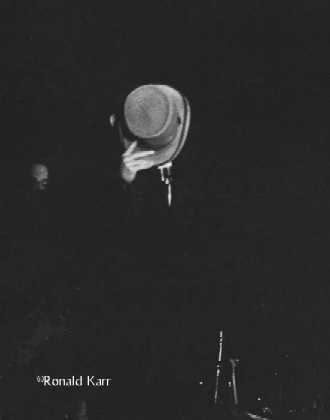 things shifted into totally different gear for the second act, as captain beefheart, with his band and entourage, filed through the audience and filtered onto the stage. the magic band, as it stands now, includes zoot horn rollo (bill harkleroad) and winged eel fingerling (elliot ingber) on guitars, rockette morton (mark boston) on bass, ed marimba (art tripp) on percussion and marimba, and drumbo (john french) on drums. the audience was suitably impressed by their weirdness. and beefheart is obviously content with the bizarre image he projects. however, this leads to a tendency to dismiss the captain and his band as just another of just another of frank zappa's freak shows, on a par with alice cooper and the g.t.o.'s. nothing could be further from the truth. captain beefheart plays a wild, intense, dissonant brand of music which has been compared to the avant-garde styles of ornette coleman and cecil taylor. actually, his music is less formal and less organized than theirs, but much more personal. the magic band is, in fact, an extension of beefheart and his musical ideas. he has been rehearsing them for months, teaching them his melodies and rhythms note for note, and as he stands impassively among them on stage, you get the impression that he is mentally directing the whole show. without his unique personality the music could not stand. he and the music were both in fine form on saturday; the magic band was incredibly tight, both with each other and with beefheart. they played almost continuously for over an hour, intermingling songs from 'trout mask replica' with new material. the captain would frequently step up to the mike to blow shrieking choruses on soprano sax and harmonica, leading the band through changes that were so precise as they were complex. the powerful sound of his four-and-a-half octave voice was muted somewhat by a distorting p.a., but this was the only bummer of the evening, and the fact that the tickets were priced at one dollar made up for it. and so, despite what you may have concluded after dozens of musical rip-offs, there still can be such a thing as a well-run concert.